Searching for a new dinner recipe? 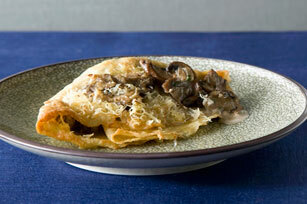 Then be sure to try our recipe for Creamy Mushroom-Stuffed Crêpes. So comforting and delicious! Heat dressing in large deep skillet on medium heat. Add mushrooms and onions; cook and stir 8 min. or until onions are crisp-tender and mushrooms release most of their liquid. Stir in chicken broth; bring to boil. Whisk in cream cheese product; cook and stir 3 min. or until melted. Spoon about 1/4 cup mushroom mixture onto half of each crêpe; fold in half, then fold in half again. Place in 13x9-inch baking dish sprayed with cooking spray. Repeat with remaining crêpes, overlapping in dish as needed to form even layer. Top with Parmesan; cover. Bake 20 to 22 min. or until heated through, uncovering after 15 min. Prepare using sliced button mushrooms, or a combination of your favourite sliced fresh mushrooms. Serve with a crisp green salad tossed with your favourite Kraft vinaigrette Dressing. Prepare using store-bought or homemade crêpes, using our Basic Crepes recipe.